It's my guess that it being a new year and all, a few of you may have made a resolution to learn to weave tapestry. It's been about 10 years since I first got serious about weaving tapestry, and as I prepare to teach upcoming classes this year I thought I would share some of the things I wish I had learned--or perhaps more accurately, paid attention to!--from the very beginning. I've had great teachers right from the start, and no doubt they told me all this at some point, but for whatever reason I did a fair amount of mucking around on my own and had to learn more than a few things the hard way. These tips fall into two categories, those relating to technical issues--how to warp and weave--and those relating to inspiration and creativity. Let's start with technique since that was for me the steepest learning curve. Build or buy a loom that allows you to adjust warp tension, ie, to make the warp tighter or looser on the loom. There are great plans for a copper pipe loom with adjustable tension on Archie Brennan's website. You can buy the materials in any hardware store and do this yourself without needing to solder (kudos to those who can, though!). There are also plans for galvanized metal looms out there; look HERE and HERE and HERE. You can treat yourself and buy fabulous copper pipe looms with springs for a variety of setts and shedding devices, in many sizes, from Mirrix. Yes, you can weave tapestry on a picture-frame (stretcher bar) loom (and I've done it more than once), but it's hard to warp it with enough tension to weave well, and you end up fighting the tension the whole time. Be kind to yourself, just don't, at first. For your first pieces, use cotton seine twine for warp. You can find it at many suppliers including Yarn Barn of Kansas, Lunatic Fringe, The Woolery, and Halcyon Yarn. Later you can branch out into wool or linen warps. Probably the most important tip of all: Use the least stretchy yarn you can find for weft. ***Do not use yarn marketed for knitting or crochet. *** I did this at first because I was so eager to start weaving and I didn't know yet where to order tapestry yarn. My results were. . . okaaaayyy, and I did get to practice basic tapestry weaving, but now I cringe when I see those pieces! Knitting yarn is luscious, but is too soft and squishy and will take forever to weave any distance at all. So, sorry, the yarn at your local yarn shop is mostly out of bounds. But there are many mail-order suppliers who sell suitable yarn out there. Some good ones to start with are Norsk Fjord Fibers' Vevgarn, Appleton (made in the UK but available through a number of embroidery yarn suppliers in the US; order the "crewel", not the "tapestry" yarn), and Weavers Bazaar. Weavers' Bazaar is also based in the UK but they ship quickly and offer a large array of colors in various weights, perfect for blended wefts. There are many more excellent yarns out there but these are good foundational yarns. 5. As long as we're talking about tools and supplies, buy the best tools and yarn you can afford. If you learn with awkward tools or shoddy yarn, you will be needlessly frustrated and have to learn again when you step up to better materials. It is a pleasure to weave with beautifully made bobbins, weaving forks and awls. 6. Get clear on the vocabulary of weaving, if you're entirely new to the field. I'm always learning new words for techniques that are new to me, but there are basic terms such as shed, pick, pass, bubbling, and draw-in, and essential techniques such as meet and separate, twining, and half-hitch that you should understand to make all your other learning easier. Ask me if you're unclear! There are no dumb questions. I was looking at some notes I wrote to myself back when I first started weaving tapestry, in fact, when I wasn't at all sure I would continue. I was frustrated by the slowness of the weaving, by the technical problems of staying in the right shed, by the simple samplers every book or beginner's class involved, and by shoulder pain. It all just seemed too hard. "the rich color, melding of painting and fiber, the abstraction, the flat yet subtly textured surface, the idea that it is painstakingly woven, the solidly-worked surface." I was just really entranced with the woven surface, with images that could be both flat and look three-dimensional. You might be entranced with different things about tapestry, but it helps to know what exactly it is you love about it, to stay motivated through the hard parts. That leads me to the second set of tips, about learning and inspiration. 7. Look at other weavers' work, in books, in galleries, and of course online. When you see work you love, stop and ask yourself what exactly you love about it. Try to put it into specific words. Can you figure out how that amazing thing was achieved, and strive for that same quality in your own weaving? 8. One way to find out how other weavers work their magic is to find good teachers. 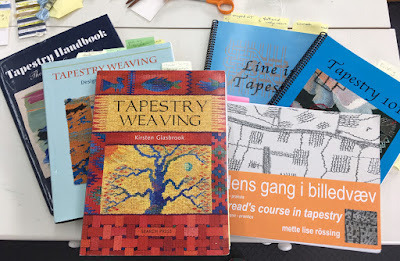 Ask your local weaving guild if they ever bring tapestry artists in to teach. Pester them to bring a teacher you want to see. For a list of tapestry teachers, see HERE. Find some good books to walk you through the basics. Here's an extensive list of books. 9. 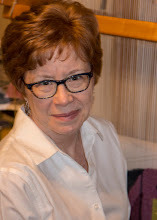 Connect with fellow tapestry weavers. Ask around where you live to find other tapestry weavers to share and learn with. ***Join the American Tapestry Alliance! *** It will unlock a wealth of information about teachers, exhibits, supplies and techniques, and online interaction on Facebook, Instagram, and via an email discussion list. They also have a mentoring program. There are lots of tapestry artists on social media; follow them and you will be inspired and educated every day. 10. As an ancient sage said, Art is long and life is short. Weave a little bit every day if you want to get better. I find a tapestry diary is a good way to make sure I do a few minutes each day. 10. That said, if you are lucky enough to have lots of time to weave, be kind to your body. Don't weave for more than half an hour at a time without taking a break to stand up and stretch. Rebecca Mezoff shares a wonderful set of stretching exercises with her classes that I run through when the timer goes off and it's time to take a break. 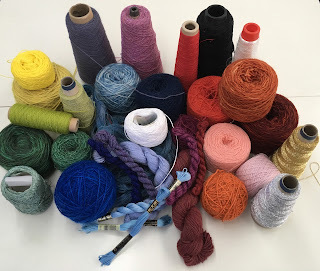 In this interview Rebecca shares a number of tips for a healthy weaving practice. Even something as simple as standing up and walking across the room while you wind a new bobbin is a good break. Especially when I was first learning to weave, or even now when I'm weaving under a deadline, I hold a lot of tension in my body and it can make for very sore shoulder and back muscles. Do what you can (yoga and massages are great) to keep your body limber and functioning, and you'll be able to weave for years. I'm sure other weavers out there have their own top ten list of tips, and I'd love to hear what they are--and what your questions or issues are that I may have overlooked. Excellent, Molly. Great suggestions. Thank you for sharing them. I would add: keep a sketch book. Drawing can be learned and is invaluable in capturing design ideas. ANYONE can draw. It doesn't have to be good. It has to remind you what you were thinking at that moment -- what inspired you, what caught your attention. You don't have to show it to anyone. Also, I like to design on gridded paper and keep a gridded paper notebook handy. Thank you, Jeane. Of course you are right, keeping a sketchbook is so important. I agree that a simple sketch can capture an idea. I could write a whole passel of posts on design strategies and techniques! Hmmmm . . .
Two clarifications: #1 cotton seine twine is awesome, don’t use cheap carpet warp (like Maysville), it’s too floppy and you will have more trouble keeping it in line. #2 though knitting yarn is lousy for tapestry, if you have a needlepoint store nearby you can buy some Paternayan Persian needlepoint wool which is excellent and can be bought in small quantities so you can afford lots of colors. Thank you for this, this is great. I would describe myself as a 'persistent beginner' - mainly because I don't practice enough. Like you say, I must do a little every day. I also love the tip about using the best tools you can. The temptation is to use very cheap/basic tools because I'm 'just a beginner'. You've given me the confidence to splurge! Thanks for reading and commenting, Karen! Every little investment we make in our tapestry practice helps us to dedicate ourselves to it, I think. And the power of daily practice is huge. Happy weaving!